This is a revised version of a “From the Local History Room” column that first appeared in May 2014 before the launch of this weblog, republished here as a part of our Illinois Bicentennial Series on early Illinois history. The subject of the article is the old Schipper and Block building, which stands at the corner of Court and Capitol streets. “Rich in history, the building’s legacy dates back before its birth,” Hyatt wrote. Once the location of a popular and successful clothing store, the Schipper and Block building’s history and “prehistory” reaches back to the period of the Civil War. The business began in 1863 or 1864 as C. Bonk and Co., which ran a dry goods store with John H. Schipper as Bonk’s partner. After Bonk’s death, Henry C. Block joined the company, which became the Schipper and Block Co., located at 304 Margaret St., a block north of the corner of Court and Capitol which later would become its location. The 300 block of Margaret Street was then known as Smith’s Row, because that is where Dietrich and Teis Smith had their business operations, including their well-known Wagon Works. In 1874, Schipper and Block moved their store to the corner of Court and Third streets – at 302 Court St., next to the post office. As their business thrived, they opened a second shop at 332 Court St., the corner of Court and Capitol streets, on Oct. 12, 1879. Some years later they opened a store in Peoria which soon after became the largest dry goods operation in Illinois outside of Chicago. The Peoria store became a Carson Pirie Scott in 1961. The original Schipper & Block building at the corner of Court and Capitol streets opened in 1879, but was destroyed by fire in 1898. Schipper died Sept. 25, 1893, in Louisville, Ky., while on his way home from Block Island near Rhode Island, where he had gone for a rest due to his ill health. 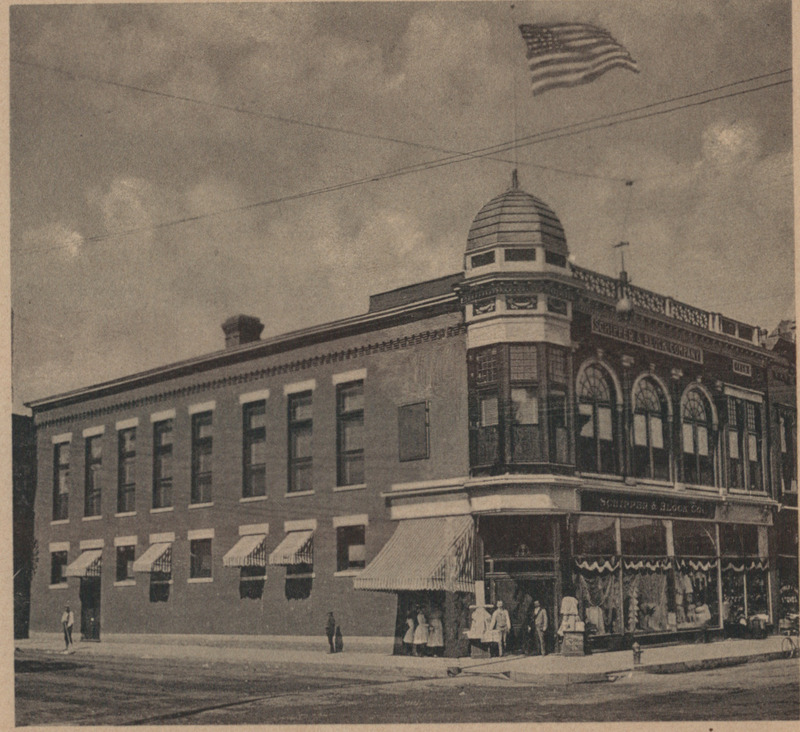 Block continued to operate the business until the turn of the century, when the Pekin store operations consolidated at the corner of Court and Capitol streets. That came about as the result of a fire in 1898 that destroyed the Schipper and Block store at the corner of Court and Capitol streets. A new structure was erected in its place. 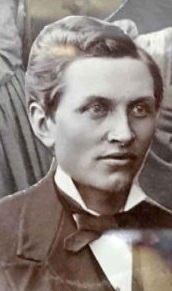 Then around 1900, Block sold a considerable amount of his holdings in the Pekin operation to George Ehrlicher, who had been Block’s right-hand man for many years. It was about that time that the decision was made to close the store at 302 Court St. and consolidate in the newer building at 332 Court St. 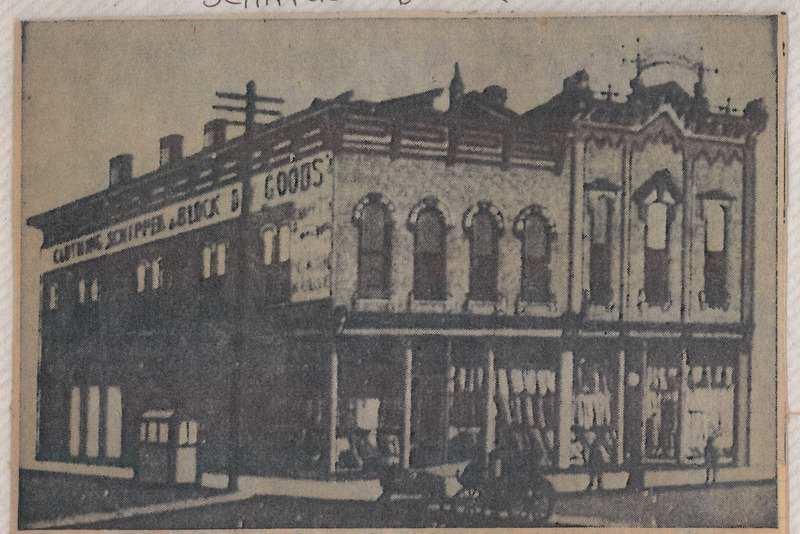 The second Schipper & Block building was erected in 1898 to replace the 1879 store after a fire, but the new building itself succumbed to flames in 1922. The company’s name was changed to Block and Kuhl Co. on Jan. 1, 1914, when Theodore Kuhl became president – but the “Schipper & Block Co.” sign remained, so everyone continued to call it the Schipper and Block building. Another fire in Feb. 1922 destroyed the “new” building, but by December of that year the company had rebuilt at the same location. That’s the structure one can see at that corner today. George Ehrlicher’s sons George Jr. and Arthur took over the business after their father, and they kept the business going until May 1962, when business reverses made it necessary for them to sell the store. George Jr. died in Sept. 1962, just four months after the sale. The new owners, Harold Whaley of Ottawa and William T. Malloy of Peoria, were unable to return the business to profitability, however, and the store went bankrupt in 1964, when a receiver was appointed. The store limped along for another four years, finally going out of business in March 1968. The Schipper and Block building would then remain vacant for 26 years. The Schipper & Block building that stands vacant today is shown in this photograph taken by Ralph James Goodwin in 1966, two years before the store went out of business. “Though much of the glamour has faded,” Hyatt wrote in 1994, “the old Schipper and Block building – as it has been called for over a hundred years, no matter who owned it – still stands on solid ground. In fact, the city recently sold the property at 332 Court St. to Tobin Brothers, with a developer’s agreement. According to Lee Williams, city marketing director, the transfer of ownership occurred Jan. 4. “‘The Schipper and Block building is dear to the hearts of the mayor and (all of those on) the City Council. They had decided that the Schipper and Block building was definitely not going to be torn down . . . because of the historic background,’ Williams said, noting that Tobin Brothers is remodeling the three-story brick building for about $350,000. More recently, the State of Illinois’ budget crunch led to the closing of the Pekin DCFS office. The old building once again went vacant and is for sale. 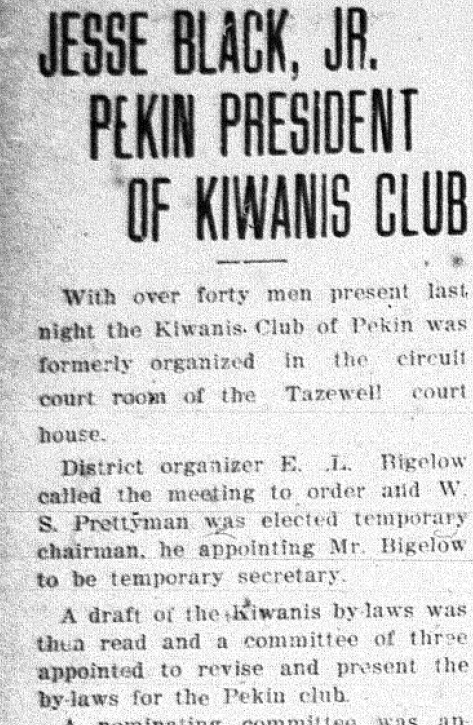 Last time we reviewed the history of the Tazewell Club, a men’s leisure group for Pekin’s professionals and business leaders that operated from 1893 to 1960. However, there is another Pekin business group that was organized at about the same time and is still going strong – the Pekin Area Chamber of Commerce. Just as Illinois is celebrating its bicentennial, Pekin’s Chamber of Commerce is now preparing to celebrate its “quasquicentennial” – its 125th birthday. Bill Fleming, executive director of Pekin’s Chamber, has graciously provided the Pekin Public Library with historical records and photographs illustrating the Chamber’s founding and history, which we’ll now review. 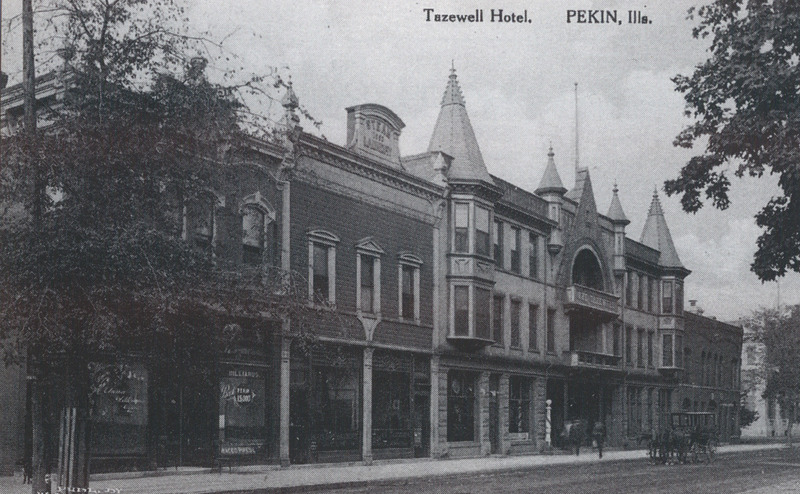 In October 1893, about a month after the founding of the Tazewell Club, a group of Pekin’s businessmen organized a group called the Citizens Improvement Association of Pekin, the original name for the organization today called the Pekin Area Chamber of Commerce. The association’s articles of incorporation – filed with the Illinois Secretary of State on Oct. 6, 1893 – state that the group’s purpose was “advancing the business interest and promoting the commercial growth of the City of Pekin.” It’s similar to the Tazewell Club’s purpose, except the Tazewell Club’s emphasis was on “the social enjoyments of the members of the organization,” whereas the Citizens Improvement Association of Pekin had more of a civic orientation and less of a recreational purpose. While today’s Pekin Area Chamber of Commerce started out as the CIAP, the group went through several name changes and a merger before it reached its present form. In 1910 the organization’s members changed its name to the Commercial Club of Pekin. The following year, the Commercial Club merged with the Pekin Retail Merchants Association, which had been founded in 1900 with the aim of promoting better business practices among Pekin’s retailers. Five of Pekin’s leading businessmen signed the articles of incorporation on the Citizens Improvement Association of Pekin in Oct. 1893: Everett Woodruff Wilson, George Herget, Jesse B. Cooper, Henry C. Block, and Joseph Verdi Graff. All five men were active in Pekin’s economic and cultural development and advancement. 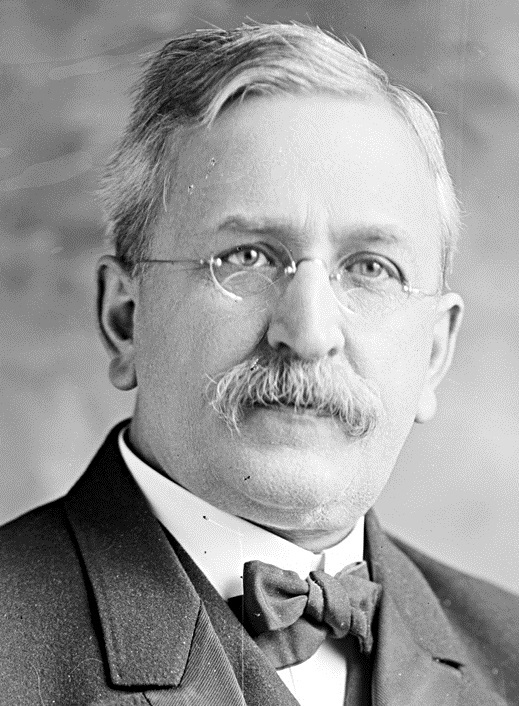 Coming from a family of Peoria distillers, Wilson later became a co-founder of the German American Bank in Pekin and first president of the American Distilling Company. He was also active in politics, serving as a Pekin alderman in the 1880s and being elected twice as mayor of Pekin in the 1890s. 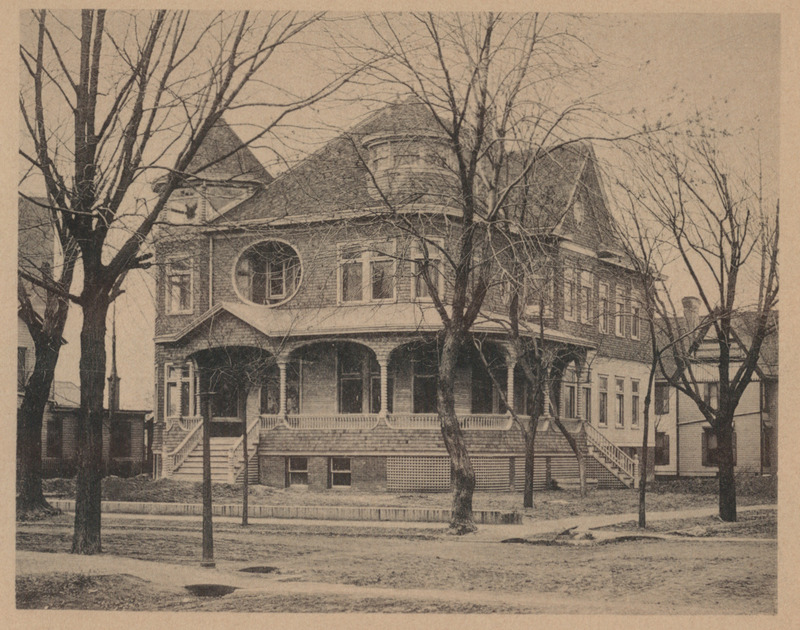 The grand home he built on South Fifth Street is now Abts Mortuary. In Pekin the Herget name has long been associated with banking. 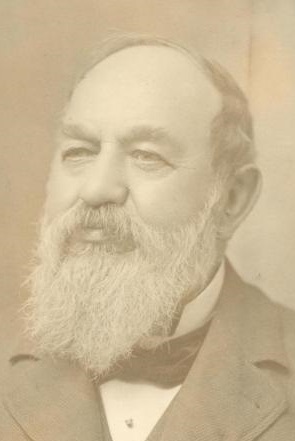 Like Wilson, George Herget was involved in distilling and later founded Herget Bank – but also invested in or headed various other companies, including the Globe Cattle Company, the Illinois Sugar Refining Company, and the Pekin Electric Light & Power Company. Herget was the first president of the Pekin Park Board and also was elected to the Pekin City Council, the Pekin School District Board of Education, the Pekin Township Board, and the Tazewell County Board of Supervisors. Herget also donated the site of the 1902 Pekin Carnegie Library. Cooper served as superintendent of the Tazewell County Poor Farm from 1872 to 1881, afterwards operating a 75-acre fruit orchard on the land northeast of 11th and Willow streets. 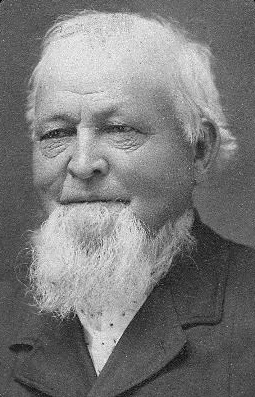 He also served as Pekin Township Supervisor in the 1880s and 1890s, and in 1893 became Overseer of the Poor of Pekin Township as well as Township Treasurer. Block came from a long line of merchants, working for dry-goods stores in Germany before coming to American in 1865, working for stores in Pekin and Peoria. As a valuable employee of Bonk & Company in Pekin, Block eventually became a partner in the business. 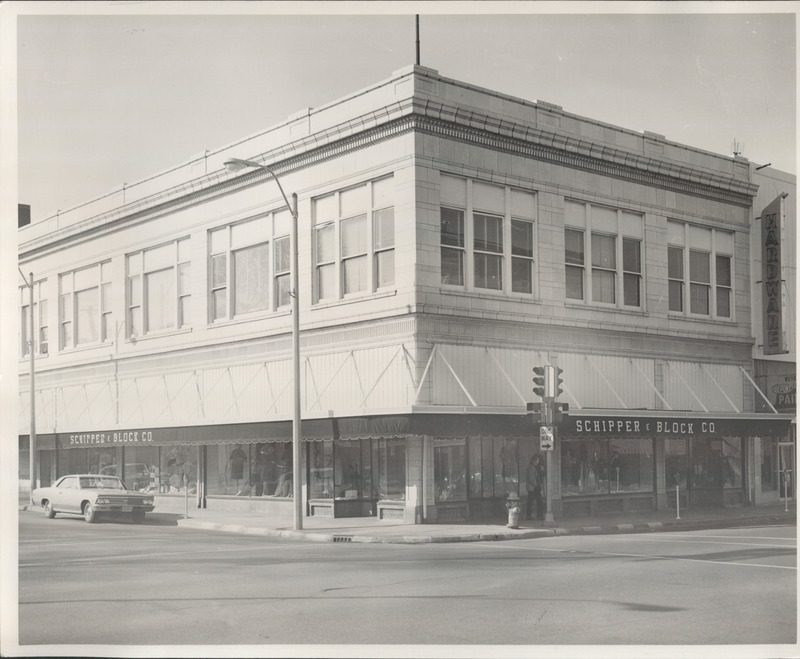 After the death of the company’s founder he became head of the business, which was renamed Schipper & Block, a Pekin downtown department store that is still well-remembered. Graff worked in the mercantile business in the 1870s while he studied law, operating a law practice first in Delavan and later in Pekin. At the time the Citizens Improvement Assocation of Pekin was founded in 1893, Graff’s law office was in the Marshall Building on Elizabeth Street, across the street from the Tazewell County Courthouse – the office is now occupied by the law firm of Kuhfuss & Proehl. Graff was also an inspector of Pekin public schools and later became the School Board president. In 1894, he was elected to Congress, where he served eight terms in office. Next week we’ll take a look at two local community organizations that have both been around for 98 years – the Pekin Rotary Club, and the Pekin Kiwanis Club. This is a revised version of a “From the Local History Room” column that first appeared in Sept. 2011 before the launch of this weblog, republished here as a part of our Illinois Bicentennial Series on early Illinois history. The Tazewell Club, established in 1893, met at this building that used to stand at the corner of Fourth and St. Mary streets. But time marches on and membership eventually declined. In 1959 the club house was sold to the Herget National Bank and was demolished in 1960 for a parking lot. Originally located on the corner of South 4th and St. Mary streets, the Tazewell Club was a grand building, worthy of the many social events that took place there. According to Robbins, the club was founded Sept. 14, 1893, at a meeting of local businessmen and leading men of the city in Holland’s Hall in Pekin, presided over by E. F. Unland, with O. F. Weber as secretary. The interim officers were Judge George C. Rider, president, and Weber again as secretary, with an organizing committee made of up Carl G. Herget (builder of the Herget Mansion), W. L. Prettyman, Fred W. Velde, W. A. Holt, and Dr. W. H. Allen. Once the club was organized, the members elected Unland as president, Prettyman as vice-president, Weber as secretary, James M. James (in whose honor James Field is named) as treasurer, and Holt, Henry G. Herget, D. D. Velde, F. P. Maus, and Henry Birkenbusch as members of the club’s board of managers.